A JEWISH woman goes shopping at the local mall in July. As she peruses racks sporting flimsy summer tops, she eyes another woman wearing a long skirt, long sleeves, stockings and a hat hiding her hair. The first woman says nothing but assumes her fellow shopper is Orthodox. While that assumption may very well be correct, theres a good chance that the observer is clueless or confused about the law behind the look. Tzniut (modesty or privacy) is a group of Jewish laws pertaining to humility and proper behavior between the sexes. To the non-Orthodox world, codes for dress and hair, which both fall under tzniut, are perhaps the most obvious  and misunderstood. Regulations for female apparel range from wearing long-sleeved shirts or elbow-length sleeves; skirts reaching a few inches below the knee (often mid-calf); avoiding skirts with slits; no pants or jeans; covering collarbones; wearing stockings and closed-toed shoes. Tzniut also embraces modesty in deportment, demeanor, speech, actions and possessions. The goal of modest dressing is to curtail a womans seductiveness without compromising her beauty. We should be attractive but not attracting, says Yehudis Heyman, who teaches classes in tzniut to pre-teen girls as part of a national program expounding the merits of modesty. Adhering to a humble dress code in todays society, with its penchant for mini-skirts, revealing silhouettes and four-inch heels, does not preclude stylishness, however. Check out funkyfrum.com, tzniut.com, headforcover.com and numerous related websites for confirmation that Orthodox women value fashion as much as their non-Orthodox counterparts  within regulated reason. Outfits are appropriate for the occasion but far from dowdy. Orthodox women cover their hair with lovely sheitels (wigs) or charming hats. The ideal is to present the regal bearing of a queen, not a distracting imitation of a celebrity. Heyman stresses that a slovenly or sloppy appearance is the opposite of what a Jewish woman should look like. Even among the Orthodox, however, gradations exist. The dress-related laws of tzniut also encompass Orthodox men but are not quite so exacting. 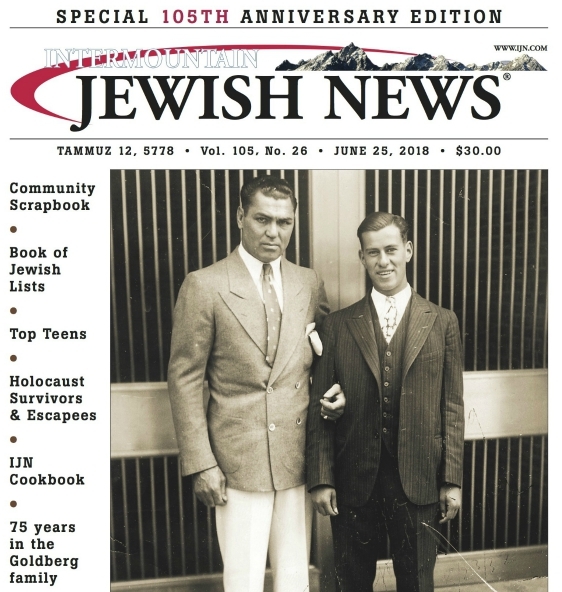 The Intermountain Jewish News interviewed three different Orthodox women in Denver to discuss the laws of modest dressing. While the laws of tzniut include other important commandments besides skirt length or closed-toed shoes, the world still makes judgment calls based on outward appearance. The IJN begins with the obvious in the hopes of revealing the hidden jewel behind the curtain. SARAH Gitler, the wife of Rabbi Marc Gitler of EDOS, is the mother of two, a rebbetzin and an attorney who works at a Denver law firm. ? For Gitler, the hardest part of tzniuts dress requirements is finding the proper attire in Denver shops. They dont sell that kind of clothing in the stores, she says. I have to go to more stores than most people to get a single outfit. Like the sleeve length. If Im looking for a dress, the sleeves have to reach my elbows. The collars cant be too low. Its difficult to find all that in one place. The liberality of apparel some people choose for the work place can be shocking, she says. Sometimes I see people wearing things that are so revealing that it objectifies them. I like to talk to people and joke with them, but I feel uncomfortable about certain subjects. I refrain from boisterousness or drawing attention to myself. I stay away from water-cooler conversations. ZIPORA Heisler, who teaches at Hillel Academy and works at the West Side mikveh, was born in Israel. Dressing according to the laws of tzniut is as natural as breathing. Its a frame of mind, its who you are, she says. I always wore stockings. I always covered my arms. In the summer, its hot but you get used to it. Then I might wear lighter-textured clothing. Heisler says she puts on her sheitel first thing in the morning before going to work and doesnt remove it until bedtime. But if shes staying at home, she might wear a snood, a head wrap that totally covers the hair. Women interpret the law on an individual basis, she adds. As long as your hair is covered, you dont necessarily need a sheitel, Heisler says. As long as your elbows are covered, it doesnt make a difference if the sleeves are a little longer or shorter. Heisler, who agrees that shopping for clothing presents a challenge, travels to Brooklyn to find appropriate, stylish yet conservative outfits. Its harder to shop today, especially with the emphasis on short skirts and finding summer clothes with long sleeves that arent too hot. Heisler adheres to the laws of tzniut and her own conscience without a second thought. Orthodox women are distinguished by the way they dress, she acknowledges. Someone covered up in todays society is going to look different. But I feel comfortable with myself. Ive never looked at (secular) women and wished I could dress like them. Ive never felt the need to dress like them. Im never envious. RANDY Shapiro Weiss grew up in a Conservative family and attended synagogue on the High Holidays, Purim and for the occasional Bat or Bar Mitzvah. Active in theater for many years, the direction of Weiss life changed in1994 when she tentatively reached out for a deeper connection to Judaism. She heard that a man named Rabbi Yaakov Meyer was teaching classes in a storefront office building next to King Soopers on Belleview and decided to check it out. About this same time, Randy met Mike Weiss. They fell in love and started studying together. Judaism was missing from our lives, she says. After studying for a year, it was time to kasher our home, give up sushi bars and commit ourselves to keeping Shabbat, Weiss says. Weiss replaced her pants with skirts. I was comfortable with that. Then I wore my sleeves below the elbows. No more short sleeves for me! About two years later, the moment arrived for the largest leap of all  the sheitel. That was a huge jump, admits Weiss, who bought her sheitel from Denvers Esti Schwab. I walked out of the door in my sheitel and I felt like a different person in a good way, Weiss says. I felt connected, more in touch with Hashem. Now Weiss puts on her sheitel on Shabbat and for annual dinners. The rest of the time she tucks her hair under one of her many hats. Although she wasnt raised in the tradition of tzniut, Weiss has incorporated it into her life with acceptance and a smile. WHEN the daughter of Kollel Rabbi Yehuda Amsel and his wife Tirtza passed away, Tirtza Amsel started teaching girls in first through sixth grades about the laws of tzniut in her home every Friday night before Shabbat. I want to instill the pride and joy of tzniut before they reach their teenage years, when everything becomes more challenging, she said. Tzniut comes from the root word tzena, which means hidden. A Jewish woman is so precious she must be guarded from misuse. We dress, speak and behave in a modest refined way that does not draw attention to ourselves. Just as a diamond must be continuously protected from theft and damage and kept covered in a place of safety, so too the dress and refined public conduct of the Jewish woman protect and guarantee her purity. What is the most precious possession that the Jewish people have? The Torah. Do we unroll the Torah scroll and hang it on display in our living room? No, we keep kept it covered with a velvet mantle behind the doors of the Ark. We only take it out and unroll it on special occasions when it is read. Its too holy to be on display at all times. A Jewish woman is a princess. She is the daughter of the King of all kings; tzniut is her crown. On the day of Queen Elizabeths coronation, she wore a crown that weighed more than 37 pounds for almost two hours. How did she manage that? It was an honor, a privilege and a pleasure to wear it.